UPDATE 8 PM: the investigation determined that a 20-year-old man, identified as Jerimiah B. Johnston, of Oswego, was riding a skateboard in an easterly direction on West Bridge Street, when he entered the roadway and struck a 2005 Buick minivan travelling south on West Second Street, driven by 38-year-old Tracey J. Faul and occupied by five children. Johnston suffered multiple injuries, was treated at Oswego Hospital and has been transported to Upstate University Hospital in Syracuse. One child suffered a minor injury and was treated and released on scene. 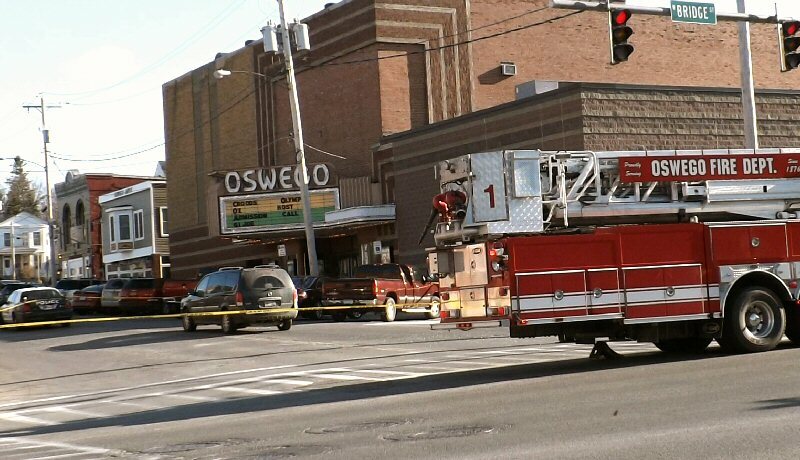 OSWEGO, NY – At about 4:40 p.m. today (April 3), emergency crews responded to a personal injury motor vehicle accident near the intersection of West Second and Bridge streets. Emergency vehicles block off Second Street at Bridge Street intersection Wednesday afternoon. The accident involved a motor vehicle and pedestrian. The pedestrian (possibly on a skateboard), is a white male who has not yet been identified. The pedestrian appears to have suffered multiple injuries and was transported to Oswego Hospital, police said. There is no word on his condition. There were minor injuries to the occupants of the vehicle. Oswego Police are being assisted by the Oswego County Sheriff’s Department in the investigation. More information will be released as the investigation continues.